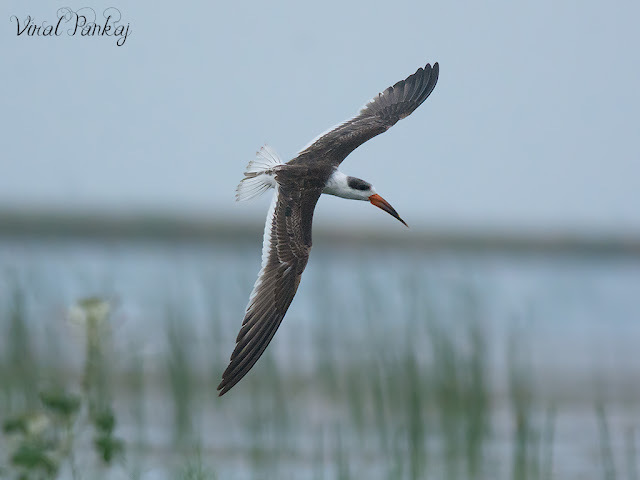 The Indian Skimmer is also known as the Indian Scissors-bill. Usually shallow water birds have their beak tipping equally but this bird has lower-half longer – hence nicknamed scissor-bill. It is mostly found on estuaries, exposed areas of shallow riverbeds (like sandbars and islands), coastal wetlands etc. Indian Skimmer has got its epithet because it skims out food from water. In polluted water, insects and fishes tend to live lower down. Thus they secure their life by avoiding a swim near surface. As this bird doesn’t dive down, and visits only water surface for food, fresh water is important for this otherwise terrestrial bird. This bird is a visitor to Nalsarovar Bird Sanctuary which is a fenland spread over an area of 120.82 sq. km., which as a whole, is one of the largest shallow freshwater lakes in India, with around 360 islands scattered in it. This shallow marsh, fed by fresh water in this season, is just perfect for Indian Skimmer. 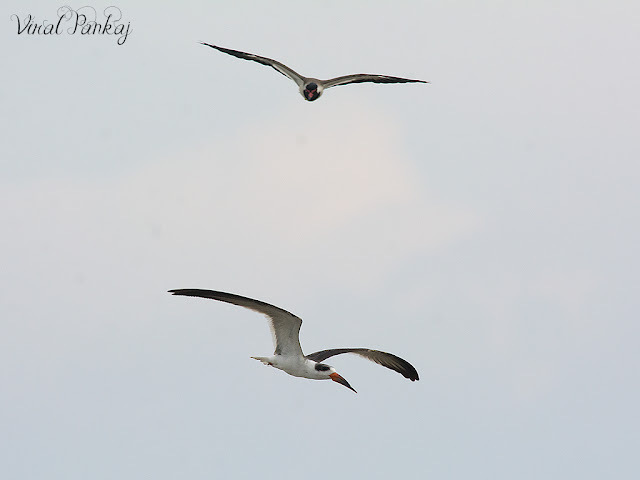 Almost every year juvenile Indian Skimmers visit Nalsarovar. Indian Skimmer is known for their unique bill, which has a much longer lower mandible, perfectly specialized for feeding technique of skimming on water’s surface for aquatic prey. Its striking orange color is difficult to miss. We sighted a single immature Indian Skimmer on one of the sandy grassy island of Nalsarovar on 12th September, 2015. This young Skimmer was brownish-grey in color with pale fringes on the shoulder feathers, the back and wing covers. The head was whiter than that in the adult bird and long thick bill was orange–brown with a dark tip. Feet and legs were faded orange in color. Wings were long, pointed with short forked tail and a central blackish feather. Skimmer was foraging and even resting with River Terns. The Terns seemed to have no objection over that particular fact. Skimmers usually forage for food by flying low over water with bill open and lower mandible ploughing the water surface. That’s why its Guajarati name is Jalhal-“જળહળ” literally meaning “water plough”. 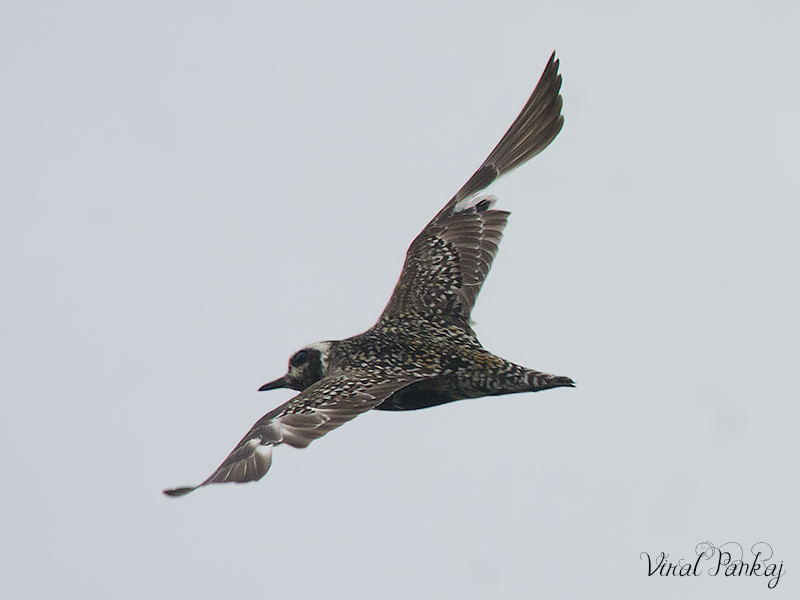 We observed its remarkable aerobatic skills to maintain bill on a steady furrowing path through the water surface. When a silver fish was confronted, the lower mandible rose up instantly and snapped shut by maneuvering of head. In this process, excess water is effectively drained from beak and pray is eaten while bird is on flight. Indian Skimmer repeated skimming and hunting up several times in the daylight and continued till late dusk. It was amazing to watch – as we were on a shaking boat with whirling wind. So we had no option left other than a mere observation. Still we were lucky enough to get some photographs at times. But on that island, there were several Red-wattled Lapwings with chicks. So by their very nature, Red-wattled Lapwings were very aggressive and noisy – summarily raucous! It looked like they were against Indian Skimmer getting settled on one place. The Skimmer looked like seeking place between River Terns and sometimes Pacific Golden Plovers. The lonely Indian Skimmer kept flying in the area between two small islands. Even during the flight, Red-wattled Lapwings were constantly mobbing around. 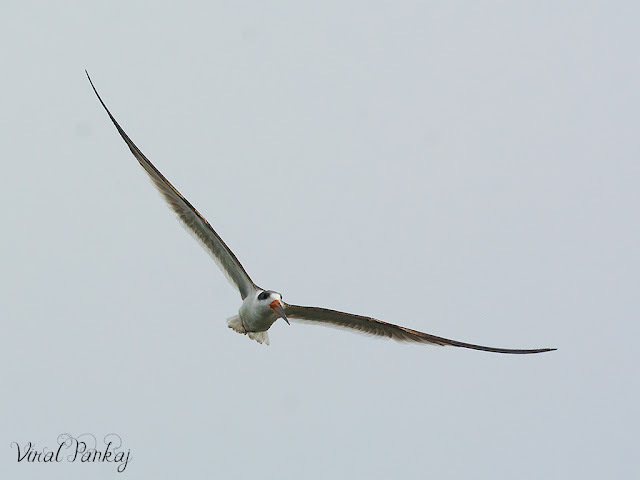 Generally Indian Skimmers are very silent. 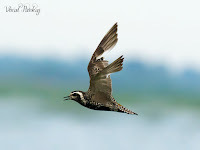 But here, disturbed by Red-wattled Lapwings, we heard a shrill screaming note like kap…kap…, particularly during flight. days back in the same locality. Finally light got dimmer due to dusk and rainy clouds – even small droplets of water started to fall. We decided to retreat. Our backward journey to the shore was somewhat scary due to bad weather, and took almost 2 hrs. Still it was a joyride – capturing photographs of an Indian Skimmer for the first time was definitely an unforgettable experience for us. We like to thanks Dr. R. R. Pathak for helping documentation and valuable suggestions.